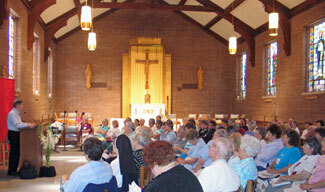 This chapel is located on the grounds of St. John Catholic Center in Little Rock. It was built to serve seminarians who attended St. John Home Mission Seminary until it closed in 1967. 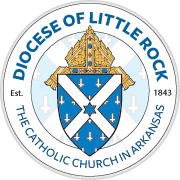 Today, St. John Catholic Center is home for the administrative offices of the Diocese of Little Rock. Bishop L. Fletcher broke ground for the chapel on Sept. 17, 1950. It was designed by architect, Thomas Harding, Sr., whose father was the architect for The Cathedral of St. Andrew in the 1880s. The chapel was dedicated by Cardinal Samuel Stritch of Chicago on Oct. 16, 1951. Cardinal Stritch had been a longtime friend of Bishop John B. Morris (1907-1946) and Chicago was the home of the Catholic Church Extension Society, which provided funding for the chapel project. The statues of the Blessed Virgin Mary and St. Joseph on the back wall of the chapel were carved of lindenwood by a German artist near Interlaken, Switzerland. The altar was made in Rome by an Italian artist, Lenatori, in 1910. It was purchased by Bishop Morris in 1915. Originally it was placed in the chapel of Little Rock College and was moved to Morris Hall in 1952. At the direction of Bishop Andrew J. McDonald, a renovation and restoration project was completed on the chapel in 1989. A new roof, ceiling tiles, central heat and air, sound system and high-wattage light fixtures were all part of the work. In addition, the rows of wooden risers and pews, which faced each other in the first two-thirds of the chapel, were removed and replaced with complimenting terrazzo floor and 300 cloth-covered wooden chairs. For more information, go to Stained Glass Windows.